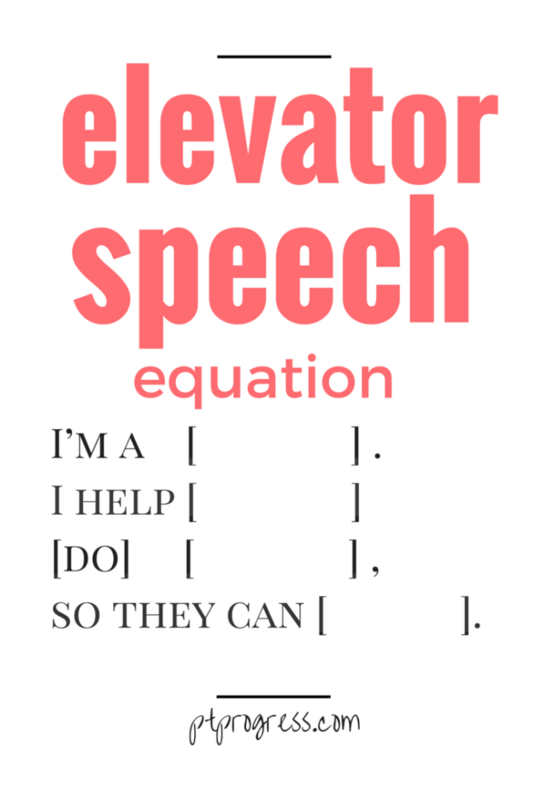 What Is Your 5 Second Elevator Speech? You’re thinking: I hate networking. I hate networking. I hate networking. If I look away quick enough, we won’t have to endure this awkward exchange of pleasantries. So what do you do? Let’s assume you want to dive head first and play the introduction game. That’s where your elevator speech comes into play. We’ve all heard the advice of having a good elevator speech. But how do you craft an introduction that gives you the best opportunity to lead into to a conversation? I’m a _____. I help ________ [do] __________, so that they can _______. I like this approach because it lets YOU define what your role is to the person asking. If you simply say, “I’m a _____” then you leave it up to the other person to interpret what you do. — “I’m a physical therapist. I help people by optimizing their movement, so they can live without pain. If you’re talking to someone who doesn’t have any idea what it is that you do, it’s probably good to keep it broad like the statement above. — “ I’m a physical therapist. I help runners identify movement faults, so they can run without pain. A specific answer like this can direct the rest of the conversation so that it’s more meaningful. Meaningful conversations lead to better connections. So there you have it, a quick way to formulate an elevator pitch introduction that doesn’t leave a bad taste in your mouth. Take a few minutes and think up your elevator pitch intro. It might just save you from that next awkward introduction. Thank you for making this so basic. I was really over thinking it.